Sometimes your site’s subscription data might get out of sync with your payment gateway — it happens. With Recurring Donations 1.3 you can now resolve that with the click of a button. 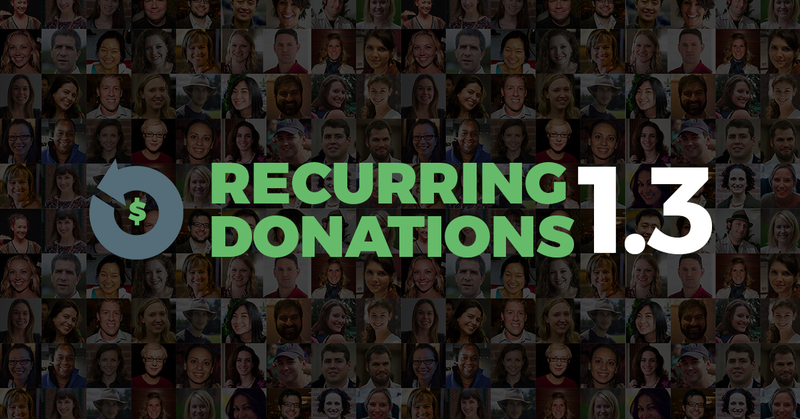 We recently launched version 1.3 of Give’s Recurring Donations add-on. One feature we’re particularly proud of is called Subscription Syncing. Sometimes, you might notice that a charge has gone through at your payment gateway for a recurring donation. But when you login to your site, you don’t see that reflected in your Give Donation History. This can happen for a wide variety of reasons, but most of them involve the payment gateway trying to inform your site (and Give) that there’s a new payment and your site either wasn’t available or rejected the notification. This is because most payment gateways only send that info once. If your site didn’t receive the notification, it’s gone. With Subscription Syncing you can go into your subscription detail screen and click on “Sync Subscription” and Give will request all the Subscription info from your payment gateway and make sure that ALL your subscriptions reflect the correct amount, date, and status in your Give Donation History. If you have an active license of Give Recurring Donations, you can upgrade to version 1.3.1 today and get these powerful new features right away. This is part of the value of being an active license holder — we continue to roll out powerful new features to Recurring and all our Add-ons and you get those features virtually for free. The Cost? You pay the difference between your original purchase and the Bundle. New: Recurring gateways that add API keys now use Give core’s api_key field type to help prevent viewing of API key content. Fix: Prevent errors when attempting to activate plugin with an older unsupported Give version or Give is not active at all. Various bug fixes and code improvements. New: Introduced the Subscription Synchronizer tool. Subscription can get out of sync with the gateway for a variety of data. This tool allows you to connect to the specific subscription’s gateway and sync the transactions and subscription information so that the data is no longer out of sync. New: A new subscriptions column now appears under WP-Admin > Donations > Donors so you can quickly see who is a subscriber and how many subscriptions they have. You can also click on the it to see that donor’s specific subscriptions. New: is_subscription_valid() method added to Give_Recurring_Gateway(). Fix: Authorize.net now properly processes the MD5 Hash option via Silent Post URL. This means subscription renewals should come in fine now from the Authorize.net API with this option enabled. Fix: PayPal Payments Pro now properly process Instant Payment Notifications from PayPal to accept renewals. Use the synchronizer tool if your current subscriptions are out of date. Fix: Renewal emails now have a proper heading for the receipt that is emailed. Fix: Don’t allow recurring checkboxes to bump to two lines for certain themes like TwentySeventeen. Various bug fixes and minor text updates. Active license holders upgrade today!